At the moment, I am not having a pleasant or a magnificent week (despite the above exhortation). I can’t get any work done. 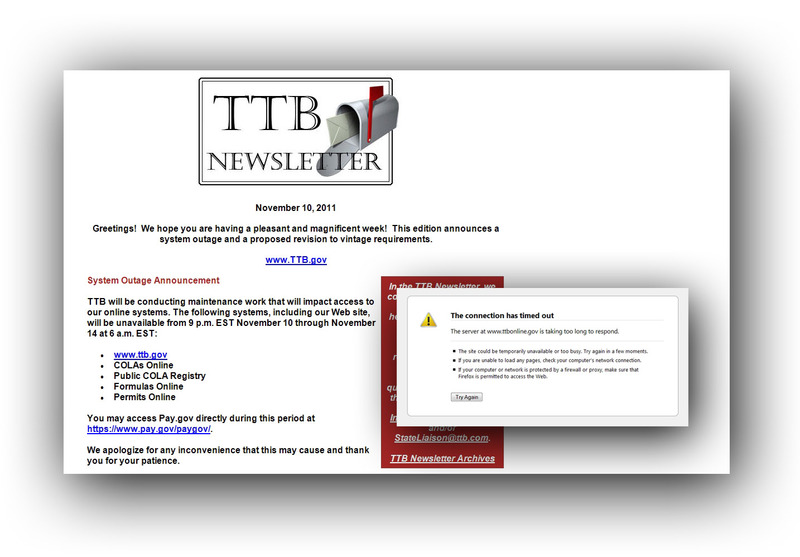 Because all or almost all of TTB’s various online systems have been altogether unavailable for the past several days. TTB provided plenty of advance notice, such as the above, explaining that all such systems will be down for maintenance during all or part of five consecutive days, from November 10th to November 14th. But still, this is an awfully long time for a critical system to be unavailable. I can not even imagine Amazon, Facebook, craigslist, or Gmail going down for a few hours, let alone a few days — without a firestorm. Is TTB’s system really a whole lot less crucial to the affected industries? Should the maintenance really take so long or happen so often? Can’t the government find a way to do maintenance in the background, without blocking thousands of regular users? On a happier note, the systems do not seem to go down unexpectedly, or crash, very often at all, in our experience. This may be due in large part to careful and robust maintenance. But the scheduled maintenance occurs fairly often and for large blocks of time. I think it was just a few weeks ago that the system was down during the course of another multi-day period. Likewise, on a positive note, the systems are very good and provide a huge benefit, when they are up and running. COLAs Online is down. I can’t search or look at COLAs. I can’t upload applications. I can’t receive approvals. I can’t see or respond to Needs Correction notices, in order to get approval or avoid a timeout. Dozens of urgent labels and scores of other labels need to sit idly, day after day, rather than begin their long march to approval. Formulas Online is down. Permits Online is down. The Public COLA Registry is down (as touched upon above). These sites are not mere conveniences, luxuries or frivolities at this point. They are indispensable; federal law more or less requires thousands of alcohol beverage companies to use these systems massively and continuously. There is no realistic option to switch back to paper in the interim. In related news about TTB Online, it is regrettable that, several weeks ago, TTB removed the ability to search permits and brewer’s notices from within the Public COLA Registry. There was a button to allow a search of, for example, all DSPs in Idaho — but the lookup is disappeared. This feature was enormously useful, and a set of old data (via the electronic reading room or FOIA) is not a good alternative. In recent weeks, many people have said TTB should fix any issues as may be necessary, but restore this functionality as soon as possible. We encourage all readers to write in with their views. Perhaps Robert is just being a baby and should step away from the computer and go enjoy a long walk in the woods. Perhaps we should celebrate the 355-odd updays per year rather than curse the downtime. Or, perhaps the inconvenience is even more detrimental than what is described here. Since all of the above issues have conspired to block me from doing any meaningful work, or seeking approval on the various beer labels stacking up in my inbox, I suppose I will go drink one beer, rather than seeking approval on another. November 14, 2011, 9:15 am ET Update: The systems seem to be back up and running, as promised. Good! Sadly, this is still missing. November 16, 2011, 9 pm ET Update: The system will go down again, over the coming weekend, as explained here. But at least it’s for a good reason, again with plenty of notice. Last weekend’s maintenance involved moving the servers to a lower cost environment, and next weekend’s maintenance will add flavor approvals alongside beverage formula approvals. I also noticed the DSP lookup is now gone. I wonder why? Did you talk to the TTB about it? Yes. A helpful person at TTB has explained that the lookup needs to be reconfigured, to make sure it will not improperly reveal tax-related information (such as an Internal Revenue Code DSP registry number). Why, what do you need the lookup for? What are the legitimate purposes that you need it for? Such information may be helpful, as TTB works on reconfiguring it. I need it often, but I suspect my reasons are quite different from yours. I typically need it to see exactly what permits a client has. I agree that if the TTB provides us tools to use and take it away then there should be viable alternatives or replacements that will fill the same function.